Why truck the waste to the tip if you can crush and recycle it onsite? ​Council tip fees are rising but you can avoid the increasing cost by reducing the waste volume or even recycling the waste on site. Perth based contractor John Rystenberg has been in business for over 15 years, providing demolition services in Perth metropolitan area. Over these years, he has seen the gradual increase in tip fees and now, having demolition waste loaded into the back of a waste disposal truck and then taken to the tip has become a massive cost. "It is not only the tip fees but the time taken to transport it and the wear and tear on the truck, not to mention the fuel cost," says John. John purchased his first Simex CBE20 Crusher Bucket fitted onto a Cat 12 tonne excavator 10 months ago and has since kept his tip fees down. With the Simex Crusher Bucket old bricks on site can be crushed into a material that the builder can then use on the building site. "If the builder cannot use the material on site we still take it to the tip but with improved efficiency, as the crushed material takes up less space than uncrushed, utilising the full capacity of the truck," explains John. "I am amazed in the efficiency we have achieved with the crusher bucket; it can handle a large amount of material such as bricks, concrete, glass, tiles and asphalt slabs per cycle as well as wet and sticky products," John said. 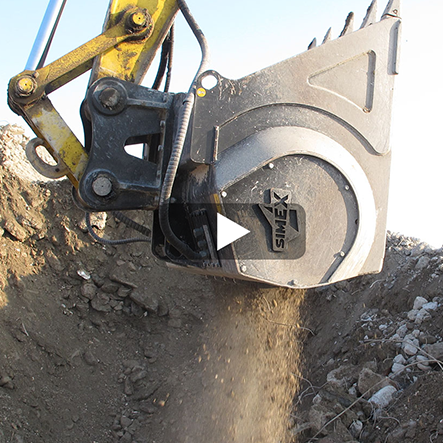 See the Simex Crusher CBE20 in action. Click the photo to see SIMEX CBE20 Crusher Bucket in action.